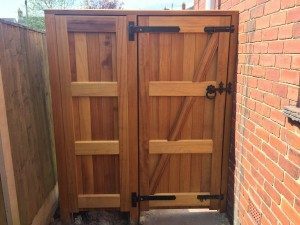 Wooden Gates in Derby are an imperative part of our customer base. We have pleasure in writing about a recent project in Holbrook , Derbyshire. The customers remit was to make secure the side of their property leading down to their garden and the back of the house. The position of the gate was between their house and the neighbours fence. The quality of the gates was important as they wanted reliability and ability to stand the test of time. Iroko Hardwood was the choice of timber to use. A natural oil finish was the desired look of choice. So the gates blended into the local area and the materials that are used around Holbrook,Derbyshire for hundreds of years. One obvious problem was that the neighbours fence wasn’t the most attractively made product. There was little that could be done to match this tatty fencing in with the new gate as the neighbours were not interested in re-newing it for some time. After a site visit it became apparent that the width of the gate was to large for a single leafed gate. A panel would be required down the garden boarder to create a full width between house and fence. The clients left me with the remit of securing the available area with gate and panel. Two four inch square Iroko posts were used to secure the right hand side of the panel with the use of rapid se concert for quick fixing. Security was achieved with two pad bolts from inside only. The house had a front door which was the point of exit. A good quality ring Latch was used to secure the gate when gaining entry exit. 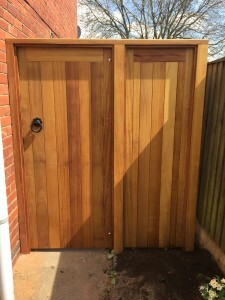 Over all this project was a true success leaving two very happy and secure customers to enjoy their wooden gates in Derby Holbrook, Derbyshire.